Azathoth, of course, is an entity created by H.P. Lovecraft. In one of his letters Lovecraft described Azathoth as the primordial entity from which other horrifying beings such Cthulhu were spawned. In stories such as “The Dream-Quest of Unknown Kaddath,” “The Dreams in the Witch-House,” and “The Haunter in the Dark,” Azathoth is described alternatively as a “daemon-sultan” or a “blind idiot god.” Whatever Azathoth is, it is omnipotent and, like all Lovecraftian entities, completely dispassionate toward humanity. What then, are we to make of this entity’s name appearing on an unwanted concrete block in Oklahoma City? We can safely rule out the possibility of a sinister Lovecraftian cult. The date 2012 suggests the monument was made last year for some other purpose before being deposited at the Paseo Grill. 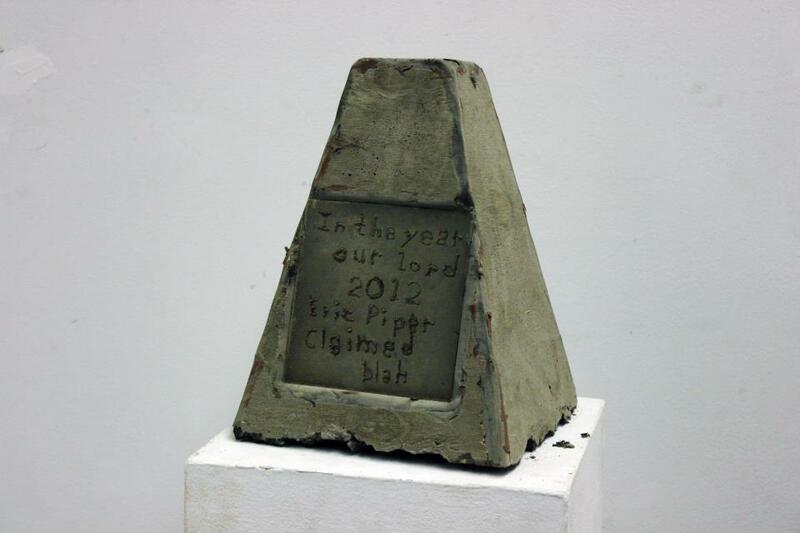 Furthermore, a true worshipper of Azathoth would not refer to 2012 as “year of our lord.” Creer Pipi is an anagram for Eric Piper, a local sculptor. (Poking through Piper’s publicly accessible Facebook photos I discovered a prototype of the monument.) While this does not mean that Piper was responsible for the sculpture appearing at the Paseo Grill, this discovery takes much of the mystery out of the monument. There is, however, a larger context to the Azathoth Monument. In January 2001, a nine-foot-tall steel and iron monolith mysteriously appeared on a hill over Seattle in an apparent homage Stanley Kubrick’s 2001: A Space Odyssey. A group of guerrilla artists calling themselves “Some People” eventually took credit for the installation. Then there are the mysterious Georgia Guidestones, the true creators of which may never be known. And recently, tiny gnome houses have been appearing mysteriously in Overland Park, Kansas. Lesley Rawlingson of the Paseo Grill told reporters she does not consider the Azathoth Monument to be art. Presumably if the monument is not art, it is merely a prank and a nuisance. But even if the people who left the monument are not true Azathothian cultists, might there still be a religious impulse behind their actions? Why do these sorts of pranks so often invite us to speculate about the plausibility of supernatural beings, prophecies, and secret cults? And what of cases like the Cottingley Fairies, in which a prank attracted the likes of Sir Arthur Conan Doyle and became part of twentieth-century paranormal lore? The either/or logic of art, prank, or “legitimate” religious phenomenon is not adequate to understand why someone would mysteriously deliver an unwanted monument to a fictional god of chaos. A number of scholars including Lynn Schofield Clark, Danielle Kirby, and others have suggested that the binaries of real and imaginary, sacred and profane, have become increasingly entangled and that some people are simply uninterested in them. Adam Possamai has written on “hyper-real” religions in which fictional media is repurposed to create new religious worldviews. In an essay entitled “The Postmodern Sacred,” Em McAvan suggests that contemporary subjects often encounter “real” religious symbols and ideas within the context of fictional and fantastic media. The fact that traditional religious worldviews are constantly filtered and refracted through fictional media representations further breaks down the barriers of real and imaginary. Lovecraft’s stories are the example, par excellence, of this creative confusion between real and imaginary. Lovecraft’s stories were painstakingly researched and often blended factual details with fantasy (itself a kind of prank). This convinced some readers that Lovecraft’s stories were actual occult lore masquerading as fiction. In a letter to Clark Ashton Smith, Lovecraft complained about another writer who was convinced that both he and Smith were genuine agents of dark powers. Religion scholars such Doug Cowan, Wouter Hanegraaff, and Daryl Caterine have written on “Lovecraftian Magick,” which emerged in the 1970s. This was a system of rituals devised to invoke Azathoth, Nyarlathothep, and other Lovecraftian horrors. Some of these magicians (and some of their evangelical critics) claim that these entities, along with Lovecraft’s fictitious book The Necronomicon, are real. But most the innovators of Lovecraftian magic were simply uninterested the binary of real and imaginary. Many of the so-called “chaos magicians” who performed these rituals described this distinction as a form of cultural hegemony that they sought to overthrow. Lovecraft’s stories can be read as a response to a fundamental dissatisfaction with the findings of reason. For Lovecraft, the grim meaninglessness of the universe as defined by scientific-rationalism was so intolerable that even the possibility of world-destroying alien gods would be preferable. Cthulhu and his ilk are beyond the limits of human reason and its facile patterns of explanation. While horrifying, they cannot be assimilated into a profane order of rationalism. In this sense, they are sacred. Indeed, of all Lovecraft’s entities, Azathoth conforms the most closely to an Eliadean notion of the sacred. In “The Whisperer in Darkness,” Azathoth is described as “the monstrous nuclear chaos beyond angled space which the Necronomicon had mercifully cloaked under the name Azathoth.” Azathoth, then, exists simultaneously at the center of the universe and completely beyond it. The paradox, however, is that we prefer this universe, hideous as it is, to our own reality. In this, we are precisely the readers that Lovecraft anticipated. We read his tales with the same exact disposition as that which prompted him to write them. Satan or Nyarlathothep, either one will do, but we will not tolerate another moment of realism. Here, Hoellebecq may well have captured the feelings of a frustrated young sculptor living in rural Oklahoma. Even if modern people do not believe in Lovecraft’s entities, the longing for them to be real can be regarded as a “religious” impulse, especially when this longing results in challenges to the symbolic order. For the so-called “chaos magicians” who developed Lovecraftian magick, performing rituals to a god invented by a pulp-fiction author was a way of challenging society’s right to declare what is “real.” Through these rituals they sought to create a rift in the sacred canopy through which mysterious forces might enter. The Azathoth Monument took this attack on profane reality further by bringing the forces of chaos out of the conjurer’s chamber and into a posh dining establishment. The public was confronted with something new that could not be removed, ignored, or explained away. The media attention (which while small, was utterly disproportionate to a misplaced block of concrete) as well as speculation over the monument’s meaning proves that the pranksters were successful. While some dismissed the object as a prank or even garbage, others claimed it was art and offered to buy it. Still others interpreted the monument as demonic and advised the staff of the Paseo Grill not to touch it. In “Religion as a Cultural System,” Geertz describes a large toadstool that formed in a carpenter’s home in Java, inciting numerous Javanese to see the toadstool and devise theories as to what it meant. Geertz wrote of this response: “The odd, strange, and uncanny simply must be accounted for––or again the conviction that it could be account for sustained.” Like the giant toadstool, the Azathoth Monument introduced something from beyond our comfortable web of meaning and threatened a community’s ability to make sense of the world––at least for a short while. The Azathoth Monument, along with the Cottingley Fairies and similar hoaxes, represents a longing for re-enchantment and a desire to introduce mysterious forces into the world. The fact that the pranksters do not believe in these mysterious forces themselves does not undermine the religious significance of these pranks. Like Lovecraft, the pranksters believe that there ought to be something worth believing in. Through their pranks they give us what they cannot have themselves––a moment of confusion, fear, and wonder. Joseph Laycock holds a PhD from Boston University and is a wandering adjunct at present. He is currently busy with numerous publications on American religious history, foremost of which is a manuscript on the Catholic seer Veronica Lueken. This entry was posted in Joseph Laycock, Politics and Religion, Religion and Popular Culture, Religion and Society, Religion and Theory, Religion in the News, Theory and Method, Theory in the Real World and tagged Adam Possamai, Azathoth, Clifford Geertz, Danielle Kirby, Daryl Caterine, Doug Cowan, Em McAvan, Eric Piper, Georgia Guidestones, H.P. Lovecraft, Lynn Schofield Clark, Michel Houllebecq, Mircea Eliade, Oklahoma City, Stanley Kubrick, Wouter Hanegraaff. Bookmark the permalink. Personally, I’m having a hard time seeing the implication you suggest between “questioning” as implied by the “mysterious” and “believing” as the goal. I know there is some kind of connection, but what do you suppose that is? I say this in thinking about the somewhat common opinion that “belief” amounts, not to an attitude of mystification, but of certainty.